Arduino: Executing applications with voice command recognition. This project refers to an Arduino sketch which with the help of a VRBot system can recognize voice commands, making it possible to run applications. For example, we could cause the execution of the relevant browser with the voice command «Firefox». Also included in this project is a Python script that implements a background service (Daemon) which communicates with the Arduino and initiates the execution of various applications. Arduino: Adjustable mood lighting with voice recognition. This project refers to an Arduino sketch which, with the help of an RGB LED and a VRBot system, can implement a mood lighting system controlled by voice commands. There are voice commands to activate / deactivate the red, green and blue. The color changes are performed with fade effects. Arduino: Security Access Control with Multi-Factor Authentication. This project refers to an Arduino sketch which – with the help of a system VRBot, a basic keyboard, an RFID reader and a piezo speaker – can implement a Security Access Control with Multi-Factor Authentication. The system comprises a security level associated with typing a password (something I know), a security level associated with the use of an RFID tag (something I have) and a security level associated with the recognition of a voice message password (something I am). Arduino: Vehicle Parking Helper with Ultrasonic Sensor and LCD display. This project refers to an Arduino sketch which uses an ultrasonic sensor for calculating the time return of the ultrasonic signal emitted by the sensor and the object reflecting the signal back. Then, with the help of appropriate physicomathematical formulas, it performs calculation of the distance between the sensor and the object causing the reflection signal. The distance is displayed in an appropriate LCD display both in inches and in centimeters. This system could be used in security doors, on cars as a helper to park or anywhere else where distance at close proximity is important. Arduino: Vehicle Parking Helper with Ultrasonic Sensor. This project refers to an Arduino sketch which uses an ultrasonic sensor for calculating the time return of the ultrasonic signal emitted by the sensor and the object reflecting the signal back. Then, with the help of appropriate physicomathematical formulas, it performs calculation of the distance between the sensor and the object causing the reflection signal. Also, the system includes a piezo speaker used to produce a tune when an object is detected too close nearby. This system could be used in security doors, on cars as a helper to park or anywhere else where distance at close proximity is important. Arduino: Device Control (open or close) via a relay and voice recognition. This project refers to an Arduino sketch which with the help of a relay (electromechanical switch) and the VRBot system can drive an external device (eg. a household lamp, a car alarm, a home air conditioner etc.) with voice commands. The system VRBot is properly trained with voice messages and then performs voice recognition. More specifically, the Arduino detects acoustic sounds and tries to recognize them through the system VRBot. Finally, if acceptable voice messages are identified, the Arduino manages them for the use of the device driven with the help of the relay. Arduino: Remote Morse Code Web Encoder. This project refers to an Arduino sketch that implements an online Morse Code web encoder. The Morse Code is until now a global communication system. However, it is now rarely used (it has been previously extensively used in the Navy and the Army in general). In this project, the Arduino works as a server, which remote clients can be connected to with the help of TCP sockets and send occasional messages on a regular alphanumeric form. Input function as a possible scenario for reproducing non-deterministic errors with defensive programming. The presence of errors in software development (and not only) is inevitable. However, over time the programs improve and tend to perfection through various techniques and methods we have developed. The deterministic problems are easy to spot because they always lead to the same error. There are tools that run through the source code of an application to find possible deterministic errors (these tools are especially useful in applications written with scripting languages such as Python, Bash Scripting, etc). Implementation of a C function to convert a typical process into a background service (Daemon) – Version 1. Below I quote a function in C to convert a standard Linux kernel process into background service (Daemon Service). If you wish to develop a server to provide services, it may be helpful. Although there are several manuals on the Internet on how to create background services, most of them don’t show a complete example, while others are barely functioning. The following function converts a standard process into a service taking everything you need into account. Also, this function is the result of a combination of several textbooks and numerous studies about this issue. Finally, it has been tested on personal applications servers and it is performing well. Implementation of functions in C for software signal management in POSIX operating systems – Version 1. Below I quote a simple implementation in C that you can use in your applications for the management of software signals in POSIX operating systems (such as the GNU/Linux). Of course, this implementation comes from a personal project of the past, especially where I grappled with system programming. You can modify this implementation to work best with your needs. Embedded systems RAM integrity check with C.
Below I quote a program in C which performs memory test in a computer system (for example the BIOS performs a memory test before loading the operating system loader in any IBM PC). However, what we quote is different in its implementation. If you are dealing with embedded systems or operating systems programming it may be useful. Portable and Abstract version for storing settings in QT applications. The QT provides an adorable way to store the settings of a program with a GUI (and not only) by means of the QSettings library. Below, we quote a personal version of the project ‘parkman‘ (Parking Manager). C++ function library for the comparison of floating point numbers. Below I quote a simple but useful library (implemented in C++) which contains functions for comparing double precision floating point numbers. Arduino: Checking 3D shapes rotation with Python, OpenGL and Arduino. This project refers to an Arduino sketch which allows the rotation of three dimensional shapes using appropriate sensors. Essentially, the Arduino collects values from the sensors and corresponds them to the [0, 360] range (rotation angle). Every time we get a pair of values (X, Y) for the rotation of the shape, the pair is sent over the USB serial port to the PC. The PC runs a Python script which produces three-dimensional shapes with OpenGL. Also, the script obtains the pairs via the USB serial port and renews the current shape of the screen. For performance reasons, the three-dimensional shape is renewed only when there are changes in the pair (X, Y). Finally, you should know that to run the Python script properly the Arduino should already be running and input sensors should have been calibrated regarding their edges. The calibration is performed automatically in the first 15 seconds (use two potentiometers as an example for both input sensors). Arduino: POV with ASCII bitmaps and algorithm “Walking 1’s”. This project refers to an Arduino sketch which implements a POV (Persistence Of Vision) case for the representation of text messages which can contain the visible characters of the character set ASCII. Arduino: Light Indicator with multi-LED bar graph, light sensor and 8-bit shift register 74HC595. This project refers to an Arduino sketch that implements a light indicator with the help of an external sensor (photoresistor) for the recognition of light (the sensor acts as input device for the Arduino), and a bar graph of many LEDs used as a rating indicator (the indicator functions as an output device for the Arduino). In this project we use an 8-bit shift register (namely the 74HC595). This way we can drive 8 different LEDs in the output committing only three PINS of the Arduino. The Ben 10 cube presented enough interest. Although it is like the classic Rubik’s cube, it had some peculiarities. Specifically, in order to solve it you need to concentrate your attention on the central square of each side so you can always orient it accordingly in the right direction to finalize plans without irregularities. The project ‘hcf’ (Histogram of Characters Frequencies). Within the framework of the course “Programming II – Laboratory” (Department of Informatics and Communications, T.E.I. of Central Macedonia) we were asked to implement as homework a program that reads characters from the standard input and then export to standard output a frequency histogram of the characters that appear. Arduino: DC motor control with temperature sensor and dynamic calibration. This project refers to an Arduino sketch which with the help of an external temperature sensor (input device) can control the rotation speed of a DC motor (output device). Also, during the execution of the program, there is dynamic calibration as regards the input values of the temperature sensor. Arduino: LEDs animations controlled with a button and a 8-bit 74HC595 shift register. This project refers to an Arduino sketch which is used to produce LEDs animations. So, we use an 8-bit shift register (namely the 74HC595). This way we can drive 8 different LEDs in the output committing only three PINS of the Arduino. If we want to drive more LEDs, we connect into a cascade form two or more (depending on the number of LEDs we want to support) shift registers and act accordingly. Arduino: DC motor control with a light sensor. This project refers to an Arduino sketch which with the help of an external light sensor (e.g: photoresistor) can control the rotation speed of a DC motor. Arduino: DC motor control with potentiometer and calibration. This project refers to an Arduino sketch which with the help of an external potentiometer (input device) can control the rotation speed of a DC motor (output device). Finally, when the sketch starts running, it calibrates the potentiometer. A nice problem that intrigued me is the “Rubik’s Magic”. I could solve the problem fast enough. In the beginning, I thought it to be quite difficult. But I finally was able to join the three rings with little effort. I will always post my best solutions on this post. I try to set up personal records. Surely, I can not compete with the champions but I think I will one day reach their standards with continued practice. Since I got my hands on Rubik’s cube, namely the classical one (3x3x3) I got hooked on solving it. I tried several times to solve it but more often I smashed it on the wall or give up. But recently I learned that Rubik’s cube is solved with algorithms. So when I learned the algorithms and the solution methodology, I started with good intentions. So after a while, I could solve it by applying the algorithms. I have also solved the cubes with 2x2x2, 4x4x4, 5x5x5 and 6x6x6 dimensions. Knowing how to solve these cubes, you can solve any major dimension ones. In larger cubes, there are likely more parity errors. This does not prevent you from solving them. Arduino: Fire alarm controlled by temperature sensor. This project refers to an Arduino sketch that implements a simple fire alarm using a temperature sensor, a piezo speaker and one LED as indicator for deaf-mute cases. The alarm checks every second if there is enough room temperature (via the temperature sensor). If there is enough temperature to consider it a fire burning in that place, then the alarm produces a musical tune with the piezo speaker and lights the LED indicator. Otherwise, both the speaker and the LED indicator remain in state OFF. Arduino: Servo motor control with potentiometer and calibration. This project refers to an Arduino sketch which with the help of an external potentiometer (input device) can move the position of a servo motor (output device) clockwise or counterclockwise. The system also features two LEDs which – each time the value of the potentiometer changes – change their brightness in such a way that it is obvious in which side of the servo motor are. For example, when the potentiometer is in the extreme left position then the left LED is lit 100% while the right one 0% (or vice versa). Finally, when the sketch starts running, it calibrates first the potentiometer. Infosystem 2009 – T.E.I. of Central Macedonia. It was a very interesting experience for me to participate in the mission of the Department of Informatics and Communications of the T.E.I. 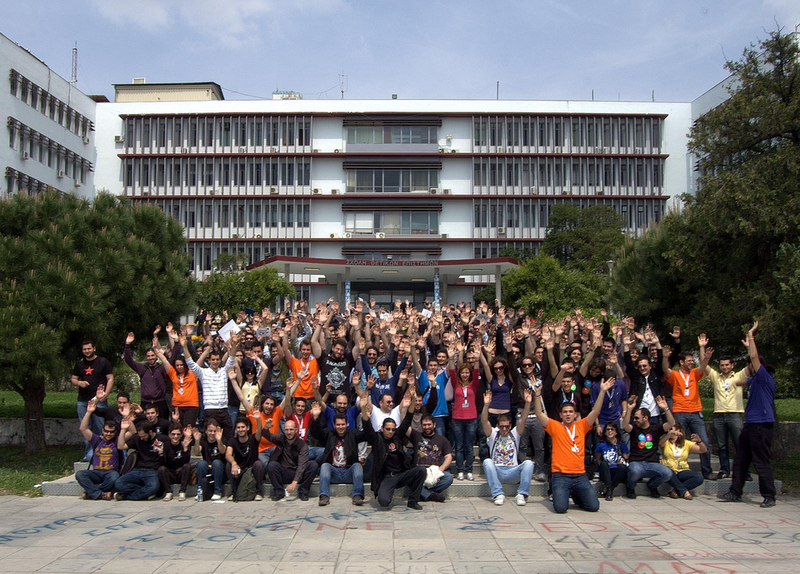 of Central Macedonia in Thessaloniki, where the Department took part in the Infosystem 2009 exhibition. Arduino: Servo motor control with a light sensor. This project refers to an Arduino sketch which with the help of an external light sensor, as e.g. a photoresistor, one can move the position of a servo motor clockwise or counterclockwise. The project ‘clinicadmin’ (Clinic Administrator). Within the framework of the course “Visual Programming – Theory” (Department of Informatics and Communications, T.E.I. 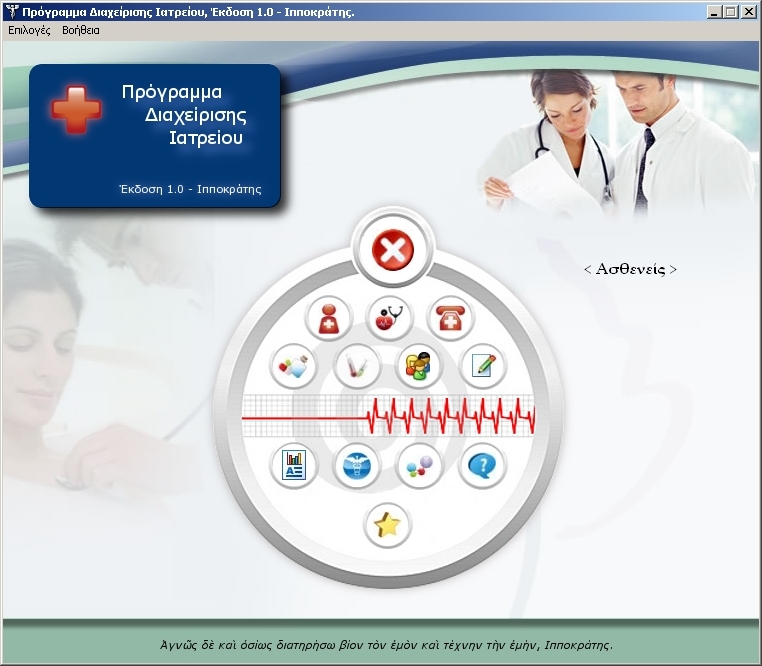 of Central Macedonia) we developed a clinic management application as a semester project. The database of the application was implemented in Microsoft SQL Server and the graphical user interface in Borland C++ Builder. More specifically, this application enables the end user to manage different patients, visits, appointments, diagnoses, treatments, prescriptions, tests, links. Rubik’s 360 Sphere is quite interesting. Once you understand how it works, the solution is then quite easy. Specifically, you need to concentrate your attention on the two axes as well as the two pendulums that are found inside the spheres. Arduino: Direct control of a servo motor. This project refers to an Arduino sketch which moves continuously a servo motor but without the help of the pre-developed “Servo” library but by direct communication, sending the appropriate PWM output to the motor. That way you have clearly complete control of the servo motor, saving enough memory and achieving better response times with less delay.